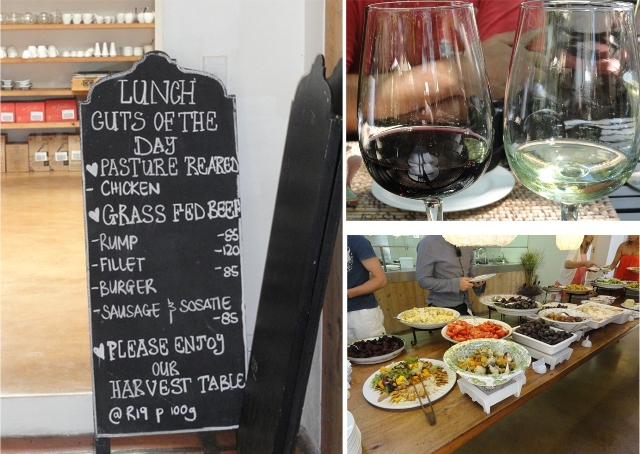 Part of our visit to Spier included 3 meals and a night’s accommodation. 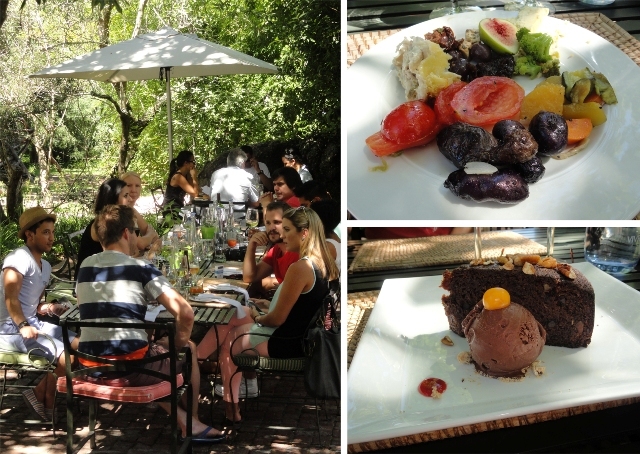 Eating And Sleeping At Spier was quite an experience. I love the feel to the hotel at Spier, which is more like an apartment complex than a traditional hotel. There are numerous swimming pools and you can also play croquet on the lawn outside the dining area. 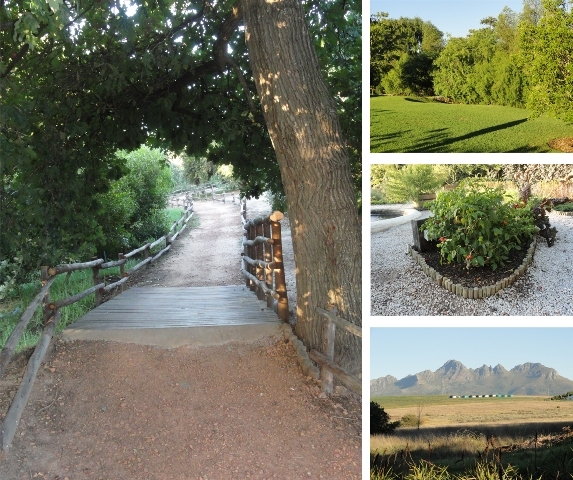 The gardens are immaculate and we took a walk along the Protea route which lies next to the Eerste (first) river. 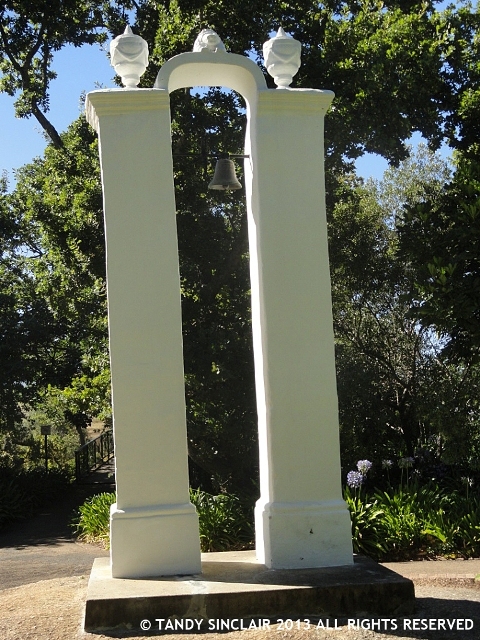 While walking through the hotel gardens we came upon the slave bell which was built around about 1825. You can do an audio tour of the estate which is an historically factual narration of the architectural history and heritage of Spier. Maintenance staff are ever present as well as the cleaning staff. The hotel offers a porter service which will take you and your luggage to your room on a golf cart. The hotel has a travel desk as well as a meeting room for business travelers. Dave and I were in room 312 which as far as I can tell is a standard room as we did not get the special turn down mentioned by the other people in our group. This 60sqm room costs on average R1700 per night. 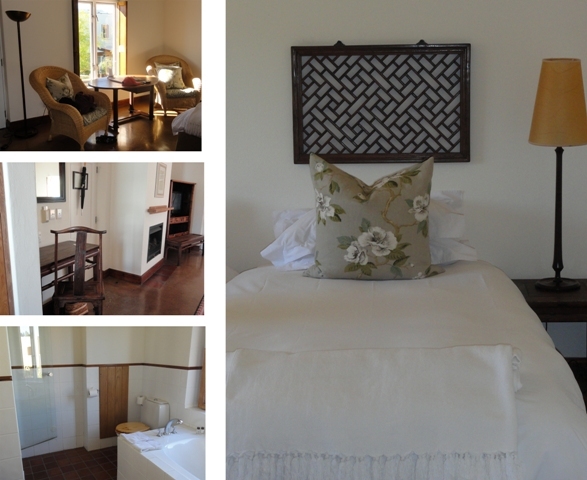 The room is large and comfortable and includes a fireplace, writing desk and sitting area. We were the only married couple in the group so I found it quite ironic that we were given the room with twin beds! The beds were comfortable, with throws and large pillows. There are extra pillows for those who need more than 2. The bedside tables are of an adequate size and the lamps provided sufficient lighting to be able to read books at night without the overhead lights on. 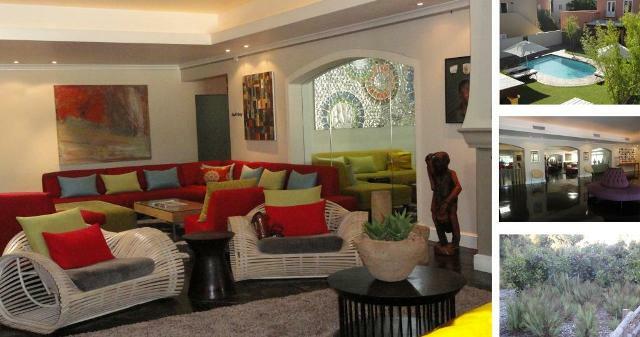 The TV is well placed and there is DSTV with 12 channels including news, sports and movies. In the room you will find an umbrella which I thought was a nice touch, as well as a safe, hairdryer and proper hangers in the cupboard which means you do not need to battle to hang your clothes up. There is a bar fridge which is moderately stocked and 500mls of bottled water will cost you R18.50 and Spier 21 Gables Chenin Blanc R120. Room service can be ordered and there is a small menu of starters, light meals and desserts – the 21 Gables Chenin Blanc is listed twice at R117 or R135. Free tea, coffee and hot chocolate is provided. The room has air conditioning and a ceiling fan. Dave and I left the aircon on while we were out waling and having dinner, but turned it off when we got back to the room. We prefer fresh air when sleeping so we opened the windows. Baden Powell Drive is extremely busy and I could hear the traffic noises from our room. Bathroom amenities include body lotion and soap at the basins, bath foam and salt at the bath and body wash, shampoo and conditioner in the shower. These items are so good that I have made arrangements to sell them through my business. There are toweling robes which I just love and the large bath was tested in the afternoon in between eating lunch and going for dinner. The shower is spacious but there was not enough water pressure for me and so I had to use the shower head as a hand held shower to rinse my hair. There is a children’s clubhouse and baby sitting service for people who want to visit as a family. The room includes an information book which lists airline telephone numbers and contact details for consulates, embassy’s etc. All of the restaurants are supplied from the vegetable gardens at Spier. 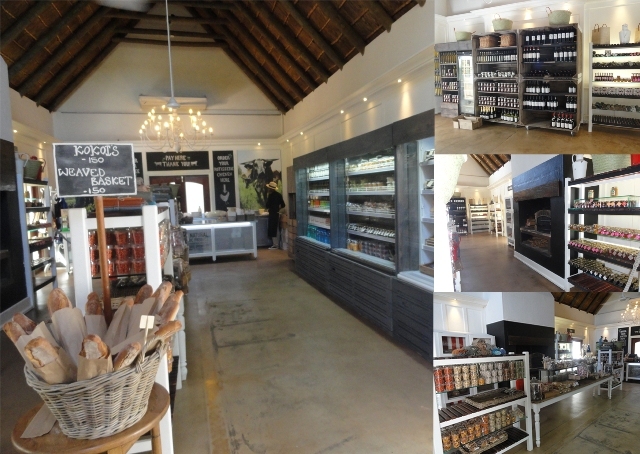 Spier is not an organic farm as they do not make use of any pesticides. They believe in using nature to combat nature. 100% of the waste water is recycled and this water is used to irrigate the farm. Spier pasture rear lamb and beef and have free range chickens on the farm. The chicken coops are on wheels and are moved around the farm so that the chickens can fertilize the crops and feed off the land. Breakfast is self service and there is a choice of hot and/or cold breakfasts items. We started with the cold breakfast and I had a bowl of lovely fresh fruit. I then had a slice of freshly baked bread with brie. The filter coffee was bitter but this can be attributed to it being left in a vacuum flask. The hot breakfast was a let down. The plates were in a plate warmer which was not turned on and therefore the plates were cold. The items in the chafing pans were not that hot and the mushrooms were cold whereas the haddock and bacon were lukewarm. There was a choice of scrambled and fried eggs in the chafing trays, as well as freshly made fried or scrambled eggs or omelets. I chose to wait for freshly fried eggs. There were no napkins on our table which was clearly an oversight because as soon as we asked for them I noticed the wait staff taking napkins to every other table. Eight To Go offers you the choice of selecting your own items to make up a picnic basket, or you can pre-order baskets the day before. You can enjoy your picnic anywhere on the grounds, and there are plenty of tables, shaded areas, and even a lovely dining area if you want to be ‘indoors’. Eight has a philosophy of farm to fork, and on offer is a harvest table. The ∞ (infinity) symbol is used to symbolize their approach to business as a cycle. If you stop in at Eight, take a look at the roof. 28 000 milk bottle handles were used to make the 14 000 flowers you can see. The chandeliers are made from plastic bottles. As part of their recycling plan, old coke bottles have been turned into glasses by Ngwenya glass for the restaurant. In order to save on electricity bills, gas is used for the kitchens and all the lights are LED. Here you can choose exactly what you want to eat and the food is charged per weight. 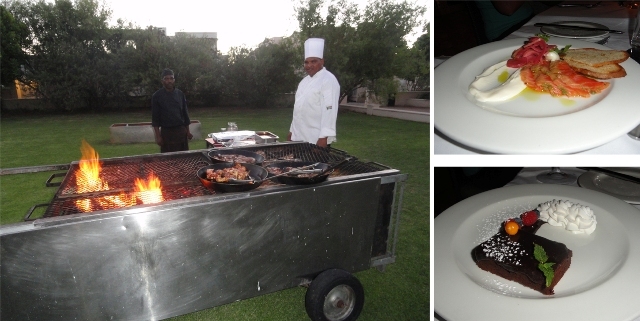 You can also select meat or chicken and this will be cooked to your liking on the braai. The food is healthy and unpretentious. The restaurant only serves wine from the estate, 1 choice of Mitchell’s beer or cider, water that they bottle on site, or freshly pressed juice. I started with a divine green juice with a lovely hint of ginger. I had two small glasses of wine in order to taste the Creative Block Wines. CB2 is 85% Sauvignon Blanc Blend and I started with the white wine. This is a 2011 vintage and borders on peppery and has a distinct guava overtone. The CB3 is a blend of Shiraz, Mouvedre and Viogner and we were given the 2010 vintage which is a warm berry red. My cold lunch plates consisted of mixed roasted vegetables, broccoli steamed with pineapple, lightly cooked tomatoes, a gentle Gorgonzola, purple potatoes, figs, preserved lemon, olive / feta / sun dried tomatoes, chicken pie, sun melon, pickled beetroot, creamy cabbage slaw, green beans, green olives & artichoke hearts. I dished up two plates and the total cost was R109.40. I had one bite of the rump sosatie and the meat was very tender and tasted good, even though it was overcooked to my liking. For dessert the choice was flourless chocolate cake, carrot cake, prune tart and chocolate brownie. I chose the carrot cake and it was served with the nicest chocolate ice cream I have had for quite some time. On the plate was a berry coulis, walnuts and meringue dust. The cake was moist and extremely tasty and the portion more than generous. Our lunch was set up for us outside, and Dominic, the restaurant manager, greeted us and spoke to us about the ethos of Eight. For dinner we were given a set menu (R250) with choices for starers of a warm pea and mint soup with bacon foam or cured and pickled Franschoek trout. 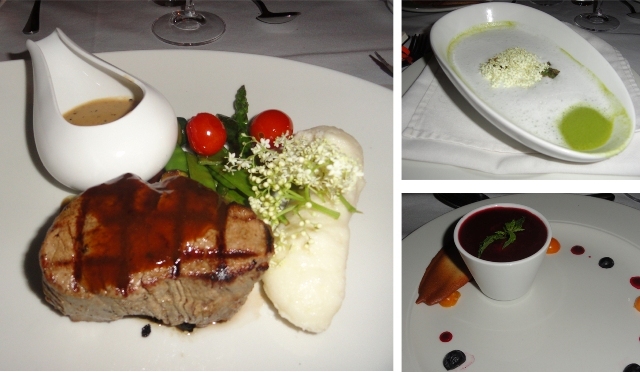 Main course choices were between oven roast free range chicken with garlic potato puree, chorizo grilled baby veg or grass fed beef grill served with creamy African maize, garden green vegetables, peppered wild mushroom sauce. The dessert options were granadilla pana cotta with berry coulis or chocolate brownie with chantily cream and summer berries. I started with the soup which had broccoli croutons. I could definitely taste the peas but I could not taste the bacon or the mint. For my main course I had the beef which was very tender. The maize was really nice but I found the sauce to be far too peppery for my palate. The vegetables were al dente and the mushrooms were divine. The panacotta was very soft and really tasted of granadilla. Disclosure: I was invited as part of a media group to Spier. I was not asked to write a blog post about my experience. This post is in line with my blogging policy. It looks wonderful, Tandy! Great write-up! Wow. That looks like fun. Thanks for sharing. Visiting Stellenbosch is high on my list of places to visit and Spier looks like a lovely place to stay. We particularly like to stay at places with a good kids club too. Thanks for the in-depth look at this hotel…although it’ll be a while before we’re able to make the trip to South Africa! The place looks beautiful and the food finger licking! Look at those couches, and that bed. But most of all look at the food. I could dine there and love my stay. Amazing. I’m confused, if they don’t use pesticides then surely they are organic? I wouldn’t mind a free stay here, you lucky fish!